While Semi-Rad seems to be the Godfather of the outdoor blogger flowchart craze in which he helps you poop outside, Justin from the The Stone Mind also put together a lot of worthwhile information on helping determine what type of climbing is right for you. Just like the rest of my site, I actually don’t serve any purpose. What I bring to the table is industry standard, accurate flowchart formatting (where the other two fell short). In some circles, that is absolutely critical. Those are the worst kind of circles. Like engineering. 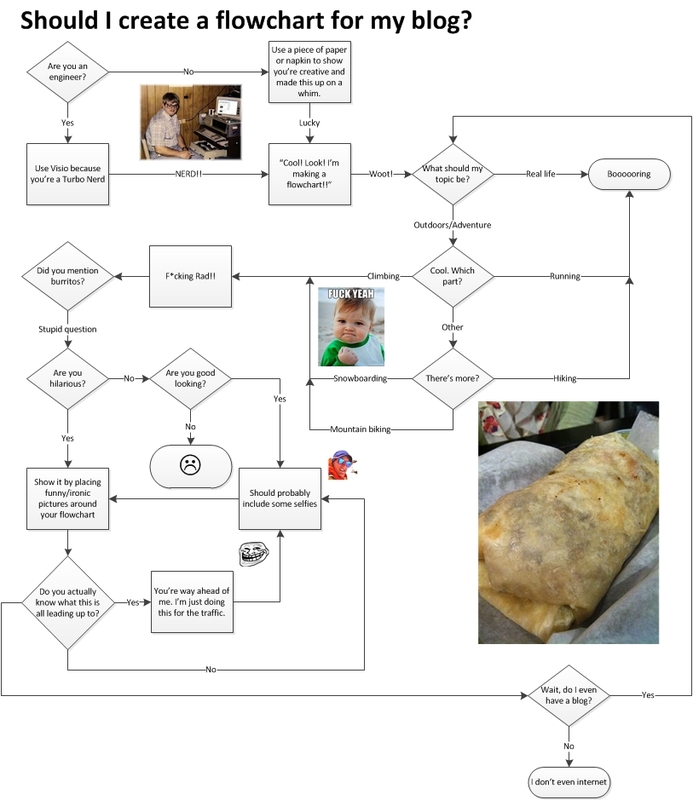 So, you think YOU want to put a flowchart on your blog? Here, let me help you decide what it should be about. But there’s no arrow that goes to the burrito? !